Home » Sovereign Security » Visit Sovereign Security at Arklow Enterprise Town Expo. 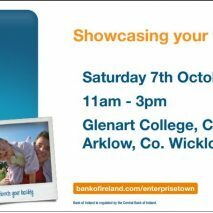 Arklow Enterprise Town Business, Sports & Community Expo. At our stand the most up to date security products will be on display along with information leaflets. Members of the Sovereign Security team will be available at the Sovereign Security stand to answer any question you should have.